CIA Interactive subscribers are the first to get our analysis of insider buying and selling and the first to get INK alerts. A single Morning INK or Market INK report or email alert can easily pay for a subscription many times over. In addition, CIA Interactive saves you time by making it easy for you to plough through reams of North American insider data. CIA Interactive subscriptions come with a two week free trial (for first time users only). During the trial, you can cancel if you find it does not meet your needs and you will owe nothing. We are convinced you will find that CIA Interactive offers a high degree of value and will form a key foundation to your investing strategy. Every first-time subscription includes a two week free trial. Just cancel within the trial period if the service is not right for you. The INK Edge Outlook is a great tool that investors can use to help identify opportunity and risk. The INK Edge Outlook ranks a stock based on VIP criteria: valuations, insider commitment and price momentum. The INK Edge will only highlight stocks that meet our quantitative screens. The objective is to make the application both a source of new stock ideas and a tool to assist with investment monitoring. Every month we publish the INK Edge Top 40 stock report which lists the Canadian stocks that rank highest on our VIP criteria. We also publish monthly Top Energy and Top Gold & Precious Metals reports which provide you with the top ranked stocks in those key Canadian resource groups. INK company profiles is a single stop to see the market performance and who is buying and selling in any North American publicly listed company. Here you can see a company's insider filings, holdings, derivatives, valuations, price, and the business brief all at once. You will also see recent and historical TSX marker data for Canadian stocks. INK is the only place to find both SEC & SEDI data. INK alerts warn you if insiders are buying or selling in stock you own. During the day or in the evening, you will be sent an email alert when an insider transaction is filed in a stock that is on your customized portfolio watch list. Searching through the SEC & SEDI data base can be a time consuming and costly task. INK strives to save users time and money. Using our patent-pending filter bar technology, investors can identify insider activity at US & Canadian reporting issuers quickly. Every trading day, in the Morning INK report, CEO Ted Dixon highlights one or two stocks with strong short term insider trading signals. Ted Dixon appears regularly on BNN TV and writes a weekly feature for the Globe and Mail. To the right we provide the top five performance leaders and laggards over the past year based on 90 day returns following mention. Leading stocks will be of interest to momentum oriented investors, while lagging stocks will be most relevant to contrarian investors. The report also provides a quick take on insider buying trends at companies on the TSX and Venture exchanges. In addition, using both insider filings and marker data it tells you what executives and significant shareholders are doing are doing at yesterday's TSX and Venture price and percentage leaders and losers. This can provide critical insight for investors who track the biggest daily movers in the Canadian stock market. To see what our Morning INK report looks like, sign up for a free trial. * Returns are not adjusted for dividends or spin outs such as EnCana in December 2009. 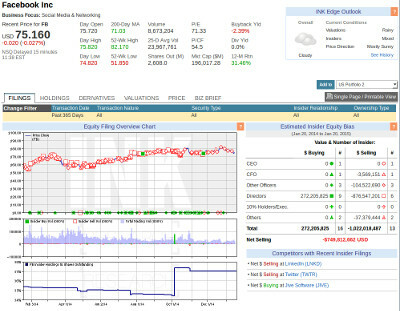 Returns for stocks highlighted with insider net selling are calculated as if the stock was sold on the day highlighted. When everyone was selling in the late fall of 2008, insiders went on a historic shopping spree for stocks. This turned out to remarkably profitable for Canadian insiders with the S&P/TSX Composite returning more than 40% in 2009 while Venture did more than twice as well, edging out even China benchmarks. In this report, we collect, organize and analyze the buying and selling actions of Canadian corporate insiders to help investors decide how aggressive to be in stocks and which sectors to favour. Through our INK indicators, we assess whether insiders believe that the Canadian market and key sector are under or overvalued. We update these indicators every day in the Market INK report and Henry Chan provides an analysis of insider sentiment every Monday. The report includes our flagship INK Indicator which measures insider sentiment towards TSX-listed stocks. The INK Indicator has been referred to as a "Key TSX Indicator" by the Globe and Mail. You can see the benefit of following insider sentiment from the chart above. As complete panic conditions and gloom gripped the market during the fall of 2008, insider buying went through the roof. Click here to compare CIA Institutional features with CIA Interactive. We provide a complete list of transaction details that US & Canadian regulators require insiders to file through the U.S. Securities and Exchange Commission (SEC) for each US reporting issuer and System of Electronic Disclosure by Insiders (SEDI) for each Canadian reporting issuer. You will find this information by clicking on the "See All Filings Details" link in the filings tab for each company. Please see INK's FAQ section for information on the definition of "insiders" and more background on filing requirements. The goal of Marker Trading reports is to provide investors with a "heads up" that insider or significant shareholder trading is taking place in a stock. These reports, also known as "TSX Insider Summaries," indicate if company officers, directors, and other insiders along with shareholders who own more than 10% of company shares have made a trade on either the TSX or TSX Venture Exchange during the previous trading day. Please see INK's FAQ section on marker reports before using marker information. Sentiment indicators are updated daily and represent companies with buy only transactions divided by companies with sell only transactions of direct ownership equity securities or trust units on the public market by officers and directors (exclusive of officers and directors of subsidiaries) filed over the last 30 or 60 days. 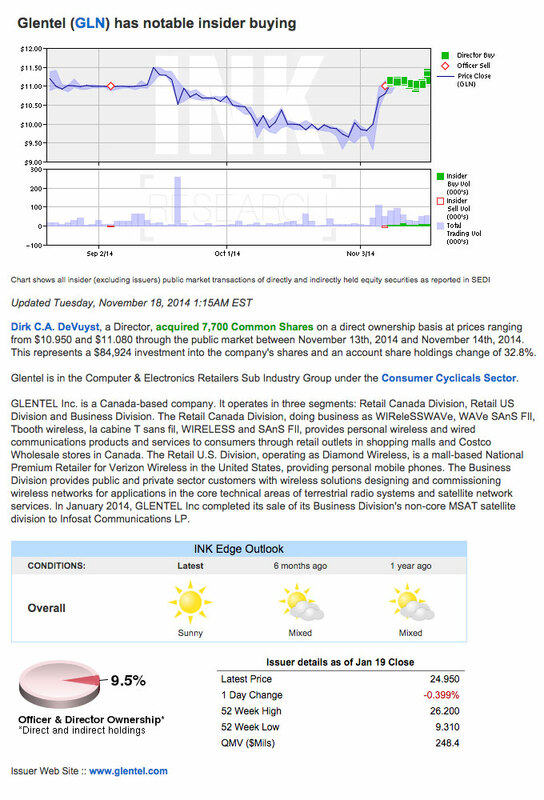 INK calculates its insider indicators for both sectors and North American industry codes. 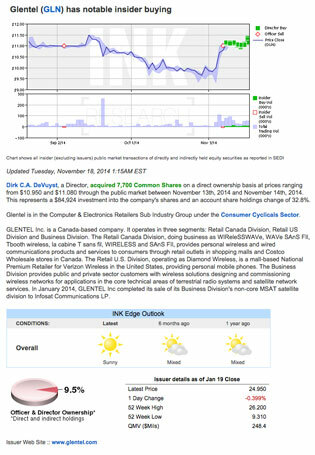 Once you login, you will find both sets of indicators in the Market INK report found under the Research tab in the top navigation bar. If you click on a sector or industry name, you will be taken to the expanded sector or industry indicator profiles. Sector and industry indicator profiles will be located under the Sentiment tab in the top navigation bar. 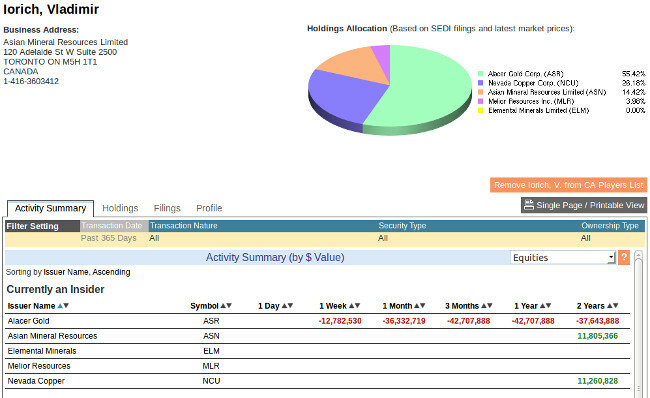 Each profile contains tabs listing companies with buy and sell filings that are included in the indicator calculations. 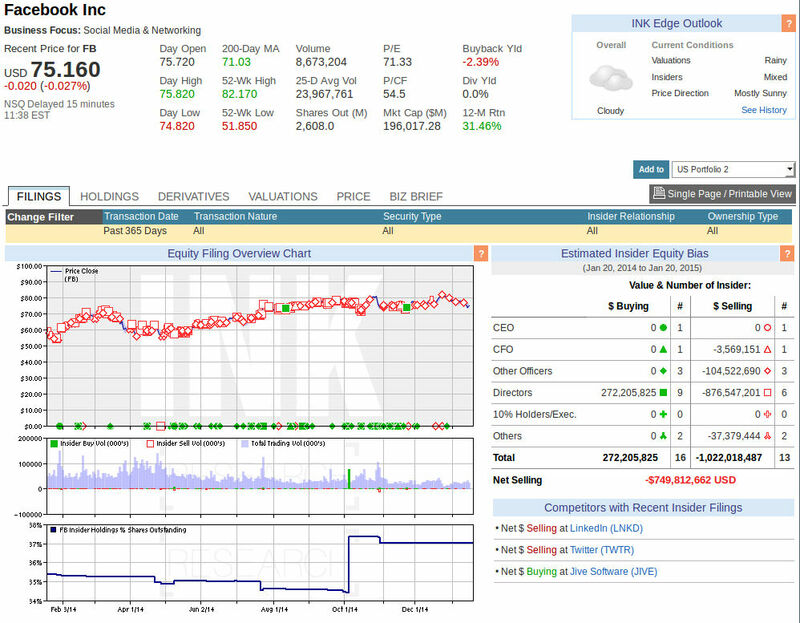 Using the INK filter bar, customize pre-set insider filing filters (see INK Screening) to see the top 50 stocks with net buying and selling for transactions you are interested in. View the lists on the website or receive the lists in a daily email.